Suzuki Motor Corporation is pleased to announce the Japanese domestic launch of the Splash, a user-friendly new compact car that combines brisk performance with outstanding roominess and comfort. 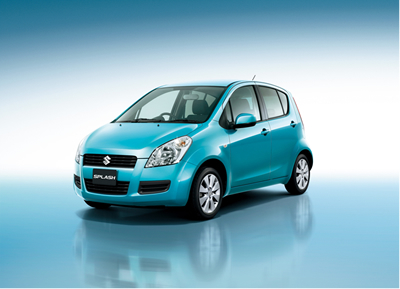 The Splash is available from Suzuki dealers in Japan from 21 October 2008. The Splash is Suzuki’s fourth world strategic model. It was unveiled at the Frankfurt Motor Show in September 2007 and has earned high praise since going on sale in Europe this spring. It’s built in Hungary by Suzuki production subsidiary Magyar Suzuki and is the first Suzuki-branded model to be imported into Japan. Suzuki created the Splash using a platform based on that of the Swift, which is renowned for its high level of driving performance. It newly developed the engine, body, chassis, and seats and tuned them through extensive tests on European roads in pursuit of world-class performance, handling, and ride comfort. The Splash has a youthful exterior design that’s also the result of extensive work in Europe. A tall body enables the Splash to be compact on the outside but roomy on the inside, allows people to step in and out with ease, and realizes great passenger- and luggage-carrying convenience. Plus, simple, contemporary interior trim with fresh, colourful design touches adds enjoyment to every drive. Suzuki targets domestic monthly sales of 500 units.